Whether you’re running a locally-owned business, commercial property, or a strip mall, a garden can truly transform the landscape and entice prospective customers. The appearance of your grounds is a good indicator regarding the quality of your business. Customers may notice an elegant flower bed or carefully trimmed lawn and know that the owner of this particular establishment takes care of their premises. They must truly care. 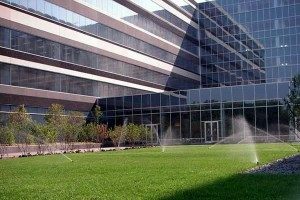 These are just a few of the benefits provided by professional landscaping services on commercial properties. Of course, the first step in a beautiful garden is to find the right landscaping service. Whether you’re looking for garden management or well-designed space for your business, an experienced contractor or service provider can help immensely. You’ll pay for quality, of course, but the investment is worth the potential return. Furthermore, you want a landscaping professional who knows the industry. Someone who understands what treatments work best for a lawn, and when to avoid using harmful chemicals that may sicken children or animals. Find a company that uses natural products and benefits your business. For professional landscaping services on any commercial property, contact Blooms Landcare by calling us at (817) 688-5352. We’ll come up with a unique, gorgeous plan for your garden or landscape to bring in new visitors and customers.